APTET 2018 Initial Key available now. APTET Exam Key 2018 : AP TET KEY - AndhraPradesh Teachers Eligibility Test 2018 answer key is available now AP TET 2018 exam was conducted in the months of February & March 2018 by Department Of School Education, AndhraPradesh. This test is conducted in all districts of AndhraPradesh through online mode, means aspirants of APTET 2018 should write computer based test for the recruitment of teachers for Classes I to VIII for all the AndhraPradesh State Govt., Zilla Parishad, Municipality, Private Aided & Unaided schools. To be proud to say AP TET 2018 (Paper-1 & Paper-2) is the first 100% CBT (computer based test) with out any offline mode test. 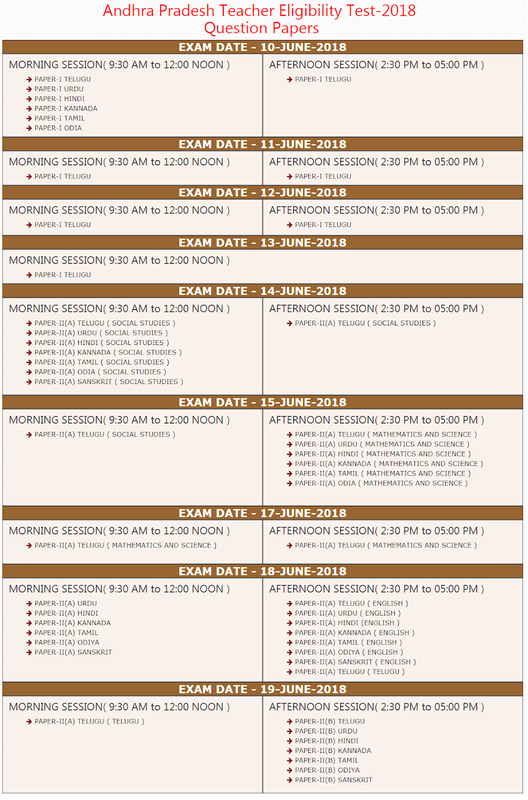 So the key was releasing for "AP-TET Paper1 Key 2018" and "AP TET Paper 2 Key 2018"
AP TET 2018 Answer Key is released for both the Papers i.e., AP TET Paper - I (Morning Session) and AP TET Paper - II (Afternoon Session). The Board will prepare 4 different sets of Question Papers for AP TET 2018 Examination - Set - A, Set - B, Set - C, Set - D. It is up to the board which set to release and this would be finalized in the last moment just before the exam starts. There is also a chance to jumble and give all 4 sets to the candidates alternatively. Preliminary key is the key released by the APTET board immediately after conducting the AP TET exam for the candidate's reference. Candidates can check their options answered in the exam by comparing the preliminary key. This TET 2018 Preliminary Key helps the students to evaluate their answers and also counter foil the answer key released by the Government. Those who have any objections in the AP TET 2018 Preliminary key can appeal to the board for re-checking the AP TET 2018 Key. The board has all rights to consider or not to consider the appeal. Based upon the appeals count and correctness of the mistakes raised in the appeal the board may consider and provide extra marks to the aspirants. 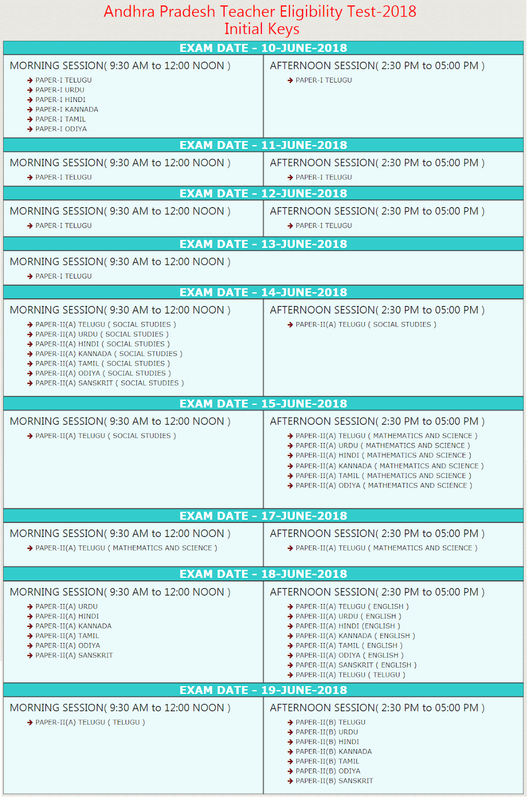 Official date for AP TET 2018 Preliminary Key Available Now. What after APTET KEY 2018? We can come for a conclusion based on the TET KEY whether we are selected in TET or Not? Congrats. You are the one among those who are going to become to a highly respectable job in the state that is teaching profession. Be aware that you won't become teacher by appearance or a pass in Teacher eligibility Test of Andhrapradesh (AP-TET 2018 Key) and will not vest any right in a candidate to be considered for appointment to the post of Teacher in Government / Zilla Parishad / Mandal Parishad / and Private Aided Schools. You are supposed to write AP DSC 2018 examination conducted by AP Government. Writing DSC and competing with others is so tough, but not impossible. You are competing with those who are qualified in AP TET 2018, AP TET 2017 and 1st, 2nd, 3rd and 4th APTETs. You should dedicate yourself and should undergo for serious preparation for at least 6 hrs a day before DSC notification releases and should extend it to 8 to 10 hrs after DSC Syllabus 2018 release. One should not neglect for preparation, thinking DSC notification was not yet released. To prepare for DSC and to be the Top among the DSC aspirants, along with serious preparation you should have guidance from mentors. The mentors may be those who have already qualified TET exam & DSC exam, or a training institute. Those who feel getting trained from a training institute is tedious and expensive can go for a DSC Online Coaching. Manabadi.com is one of the best sources for AP DSC Online Coaching / Training 2018. Note: Phsically disabled candidates with at least 40% of handicap only shall be considered in respect of visually and orthopedically handicapped. With regard to Hearing Impaired candidates, a minimum of 75% handicap shall be considered. Click on "Relevant TET Key"
As we all know there will be 2 papers in AP TET Examination - Paper - I & Paper - II. Coming to the pattern of the examination both Paper - I & Paper - II will have only Multiple Choice Questions; there will be no theory based questions. One major advantage for candidates who appear for AP TET 2018 is that there will be no negative marking. This means Marks are not deducted for wrong answers. They can attempt all the questions though they are not confident of all the answers. Once the AP TET 2018 Key is released they can compare their answers with those given in the TET Key and analyze their marks or even rank. Let us see the detailed pattern of both the papers in AP TET 2018 Examination.